Read Across America Day is March 2nd and my school is celebrating all week long with some fun Dr. Seuss inspired activities! I love this week and we always have such a fun time reading Dr. Seuss books. The kids always love hearing them and they love the silly rhyming words that are included in his books. After reading this book, I am going to give my students a paper sock to cut out and color. They can color it red, orange, yellow, green, blue, or purple. After they cut out and color their sock, they are going to bring it over to the carpet where we will create a graph on the carpet by sock color. We are going to: *count how many socks are colored each color *tell which color is greater *tell which color is less *combine two sock colors to create addition equations *tell how many more to make two sock colors equal So much math discussion in this math activity! What Pet Should I Get? After reading this book, I am going have my students collect some data about what pet their friends would want to have. My students will ask seven friends the question: What pet would you like to have? 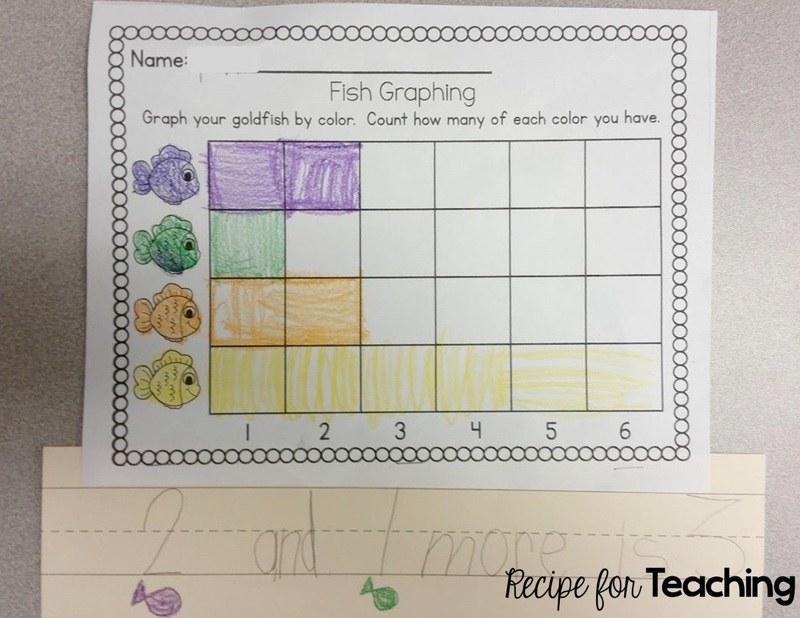 The choices on the graph are cat, dog, bird, or fish. They will ask their friend and then color their choice on the graph. At the bottom of the graph there are pictures of 7 kids so when they ask a friend, they color a kid's face. Whenever I have used these types of graphs with my students, I always remind them they should have 7 boxes colored on their graph in the end. I also have a recording sheet for students to share their data. Ten Apples Up on Top! 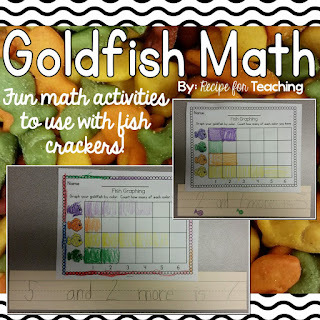 I have a Goldfish Math Activities pack in my Teachers Pay Teachers Store with a lot of fun goldfish themed math activities. 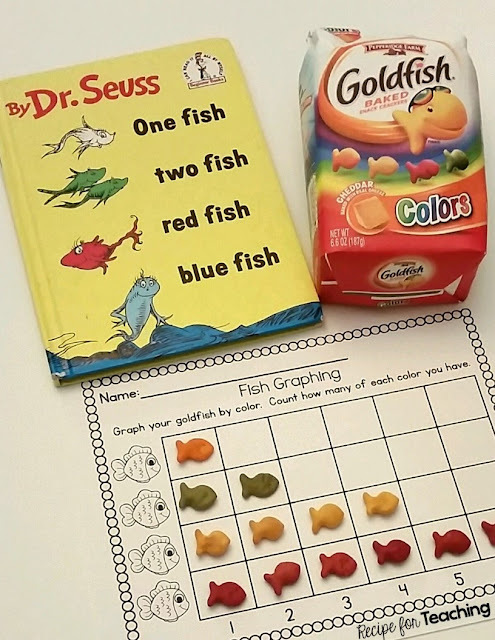 I am planning to use the goldfish graph from this pack with my students to sort and graph goldfish snacks by color. Then, they choose two colors to add together. I used this with my students last year and they did a great job with it! You can check out this pack by clicking the image below. 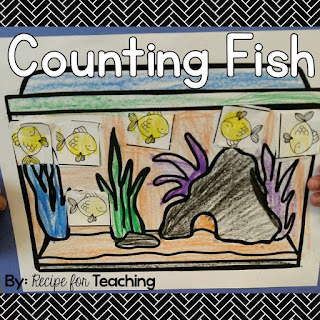 I also have a Counting Fish FREE download in my Teachers Pay Teachers Store. Just click the image below to check it out. 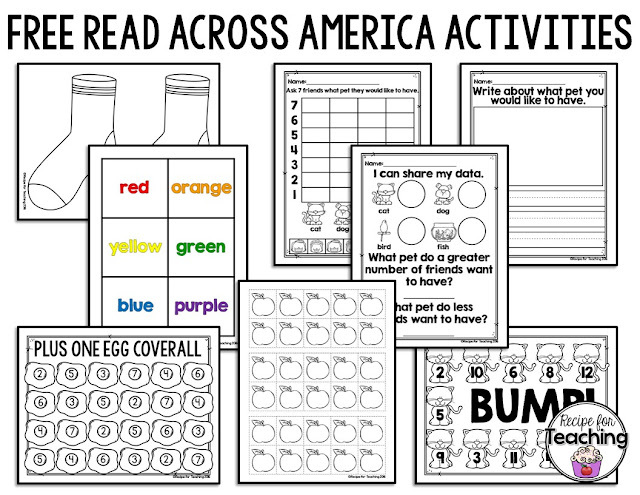 I created a document with some of these activities that I shared for FREE! Just click the image to grab your FREE activities! 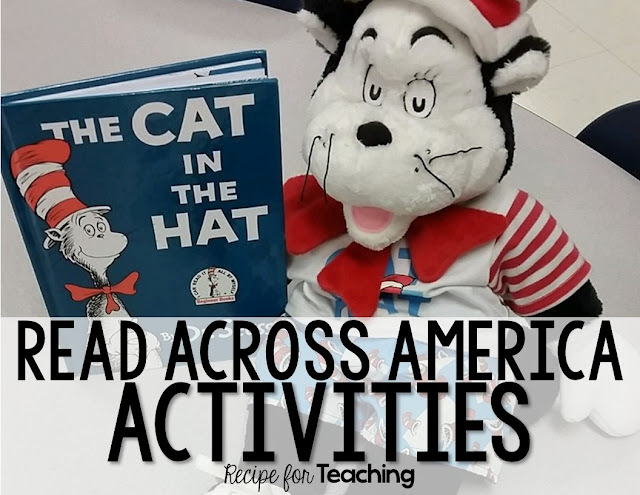 Does your school celebrate Read Across America Day? What activities do you have planned to do with your students?